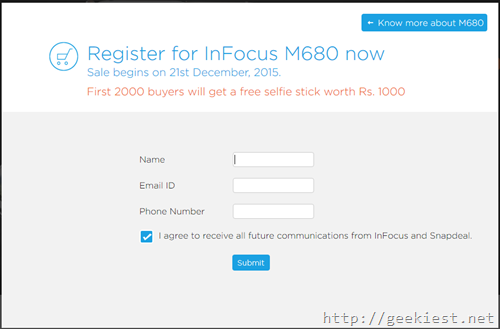 inFocus released another budget smartphone, InFocus M680. 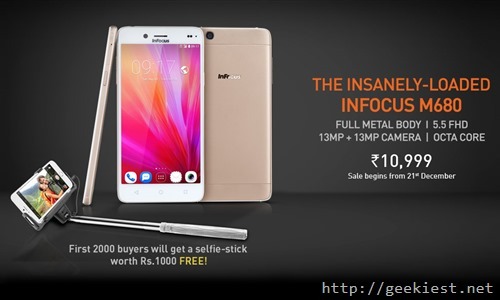 This Android phone will have a full metal body and 5.5 inch full HD capacitive touch display. The phone will be 7.25mm thick and 158 gms. The 64-bit Octa-Core 1.5 Ghz MTK MT6753 processor, Mali-T720 MP2 GPU and 2GB DDR3 RAM with 16 GB internal memory and it supports up to 64GB of microSD card. The M680 will have two 13 megapixel cameras one at front and one at rear side with Samsung 3M2 sensor and F2.2 aperture, Full HD recording. Dual SIM (Nano), the second SIM card slot can be used as Memory card slot. You will not be able to use the second SIM while using the microSD card. Sensors : Accelerometer, Gyro-sensor, E-Compass , Proximity . The phone will be available in Golden and white colors.